Feline herpes is a common cause of respiratory infections in cats. Sneezing, stuffy noses and watery eyes aren't just symptoms of a kitty cold. For instance, they can mean your cat has feline herpes. Learn how to recognize, treat and prevent this highly contagious virus. Feline herpes has a full clinical name: feline rhinotracheitis virus. 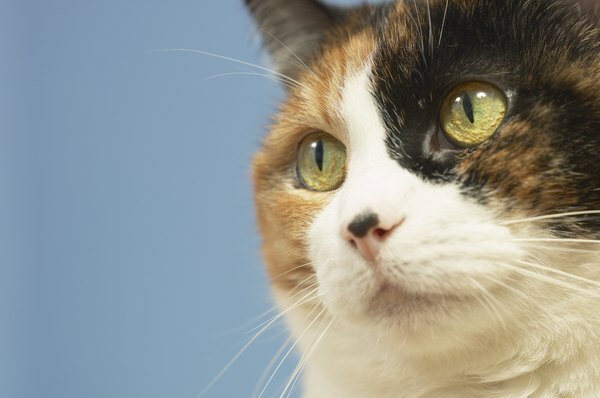 This virus causes about half of all of the respiratory infections that cats get. Almost every cat that ever comes in contact with another cat has been exposed to the herpes virus. Once a cat has been infected with the virus, she'll carry it for the rest of her life. In times of stress or illness, the virus may flare up and cause her to be sick. Feline rhinotracheitis virus vaccines are part of the standard vaccination protocol for cats. In the most common cat combo vaccine, the FVRCP vaccine, the "FVR" stands for feline rhinotracheitis virus. If a cat has never been exposed to feline herpes and gets the vaccine, she will have fairly good protection against this highly contagious virus. Generally, feline herpes will rear its head when kitties are experiencing stress or illness, such as when a baby or new pet joins the nest, during and after a move, or when other major changes occur in the home. The most common symptoms of feline herpes are sneezing, runny nose, congestion and conjunctivitis. Cats with herpes outbreaks may also develop lesions on their eyes or have a fever. Although rare, cats with severe herpes outbreaks may develop pneumonia and need intensive vet care. In minor cases, cats will have stuffy noses and runny eyes for seven to 10 days and can shed the virus for up to three weeks. In these cases, supportive care at home is usually all that's necessary. If your cat is congested, try bringing her in to the bathroom when you take a shower, or let her spend 10 to 15 minutes in a room with a humidifier to help her breathe easier. Wash her eyes and face a few times a day with a warm washcloth to help her stay clean and comfy. In a more severe case, a cat may become so congested she stops eating and becomes lethargic. If your kitty stops eating for more than 24 hours, you should either take her to the vet or force-feed her, as cats that stop eating can develop a life-threatening condition called fatty liver disease. If either symptom develops, schedule a visit with your cat's veterinarian, who may prescribe antibiotics or eye medications to lessen the risk of secondary bacterial infections. Your mother may have warned you about the school water fountain when you were a child, and in the case of feline herpes spreading from one cat to another, she would have been right. This virus is highly contagious and is spread through infected eye and nose discharge and saliva. If you have a cat with herpes in your home, you can take steps to lessen the risk of transmission to your other kitties. Wash the food and water bowls regularly, scoop the litter box at least once a day, and wash all cat beds and blankets regularly. If your cat already has feline herpes, you can help prevent outbreaks with just a few easy additions to your feline friend's diet. First, be sure to feed her a high-quality food, preferably a grain-free food with high protein and low carbohydrates. The better food you feed, the healthier your cat will be and the more likely she will be to fight off the virus. You should also give L-lysine to your cat every day. L-lysine is an amino acid that slows down viral replication. This supplement is available as a powder to add to her food, as a treat or as a paste. Can Cats Get the Herpes Virus & the Calicivirus From Humans? "What Are the Causes of Dog Hair Loss, Scratching and Oily Coat?"